May 10, 2017, 1:08 AM · You've probably seen or heard some mainstream media headlines in the last few days about a favorite topic: the sound of Stradivari violins vs. the sound of modern violins. Here are a few extreme examples: "Science proves Stradivarius violins just aren’t that great" from Cosmos Magazine, and "So much for Stradivarius: People think cheap new violins sound better than expensive models" from the Daily Mail -- and there are plenty more. So Stradivarius violins just aren't that great? And "research...might have finally consigned that pre-eminence to the realm of myth"? "Cheap violins" are better than Strads? Let's just say there is some hyperbole going around. The headlines refer to an article published Monday in the Proceedings of the National Academy of Sciences of the U.S.A. (PNAS). The new analysis draws on data from a 2014 experiment by violin maker Joseph Curtin, D'Addario researcher Fan Tao and scientist Claudia Fritz, also known as the "Paris Experiment." For background: In that experiment, 10 soloists evaluated 12 violins, in order to come up with their preferences. (The soloists were Olivier Charlier, Pierre Fouchenneret, Yi-Jia Susanne Hou, Ilya Kaler, Elmar Oliveira, Tatsuki Narita, Solenne Païdassi, Annick Roussin, Giora Schmidt, and Stéphane Tran Ngoc.) When it came to preference, six violinists preferred new violins and four preferred old ones. The players did not do better than the roll of dice during a seven-minute guessing test at the end, in determining which violins were old and which were new. This experiment followed a 2012 experiment, which took place at that year's International Violin Competition of Indianapolis. The the new conclusions published Monday are based on a comparison of a total of five Stradivari violins to five modern-made violins, over two separate sound tests, one in Paris and one in New York. The conclusion: the moderns were louder, and both audience and players liked louder better in these circumstances. Violins were compared in pairs (always paired old-modern), with two soloists playing 10- to 20-second excerpts. Audience members were asked to rate the projection of each pair, and they tended to rate the modern violins as being louder. Additionally, in the Paris test, which had 55 listeners, audience members were also asked to determine if violins were old or new, and they guessed mostly inaccurately -- 122 of the 273 guesses were correct -- about 45 percent. In the New York test, which had 82 listeners, preference was asked, and both players and audience said they preferred the sound of the moderns. The louder the violin, the more people liked it. The violin determined by consensus and scientific measurement to be the loudest was a modern violin, which was also deemed loudest under the ear, by players. Find the full study here.. The violins for the Paris test were selected from a pool of nine old Italian and 15 modern violins provided by dealers, collectors, players and makers. Only two of the violins from the Paris Experiment, one Strad and one modern, were still available for the second sound test in New York, which took place in 2013 during Mondomusica. So for the NY experiment, the two additional modern violins were chosen by a preselection process from 15 violins submitted by makers; while the two additional Strads were "the only ones made available to us at the time," according to the study. I've written many times about the fact that violin-making is in a new Golden Age, and at Violinist.com we are engaged in an ongoing effort to familiarize readers with today's finest luthiers, posting demonstrations of modern violins and of modern violas, as well as linked lists of award-winning luthiers and love stories involving players and their modern instruments. I am ready to conclude that modern violins are very worthy of consideration by the finest violinists -- I have seen, heard and played them firsthand. Nonetheless, I'm not ready to conclude that "Stradivarius violins just aren't that great" or that "their pre-eminence is myth," based on this research. I'd wager a guess that most violinists -- and violin makers -- aren't, either. While these experiments have given modern makers some much-needed credit where credit is due, they do not merit a wholesale dismissal of the art and effect of Antonio Stradivari and Giuseppe Guarneri del Gesù, whose fiddles remain (often quite literally) the models from which most violins are crafted. The PNAS article begins, "Old Italian violins are routinely credited with playing qualities supposedly unobtainable in new instruments. These qualities include the ability to project their sound more effectively in a concert hall -- despite seeming relatively quiet under the ear of the player -- compared with new violins." This seems to be the major "myth" that the new conclusions were meant to debunk: the idea that a violin could be literally quiet under the ear but loud in the hall. But is it actually something players are seeking in an instrument? Or is it more a description of the way that regular players of Strad violins have to approach their instruments, which are typically 300+ years old? The study quotes Frank Almond saying, "a peculiar (and sublime) aspect of great old Italians is that the sounds somehow expands and gains more complexity from a distance, especially in the concert hall." He also is quoted saying that moderns can sound loud under the ear, but not in the hall. The implication is that, since the study concluded that the violin that was loudest under the ear was loudest in the hall, Frank is simply wrong. Are we really ready to conclude that this kind of study -- which gauges an audience's impressions of 20-second excerpts on a shifting display of anonymous pairs of violins -- overrules the conclusions that an artist like Frank Almond has made over some 20 years of playing several specific Stradivari violins? I think this misses the mark. There certainly are violins -- old Italians as well as moderns -- that don't project as well as the player perceives them to "under the ear." Conversely, there is support for the idea that something can seem "soft" under the ear but still be projecting, but that concept has some complexity. Violinists who play Strads report that if you play them aggressively they don't respond with more volume; instead they simply shut down, sound-wise. If you play them gently, then they project. I've experienced it personally when testing Strads: it feels like you are playing "soft," and yet, playing "soft" gets the better projection from the instrument. You can play a lot rougher ("louder") with a typical modern violin, and it will still respond with volume. With a Strad, you are not literally playing quieter, but that approach gives you that kind of subjective feeling, that you are playing "soft" to play loud. To that end, this quality of needing to play "soft" to elicit the best (and biggest) sound is present in some moderns as well; it is something that violist Richard O'Neill mentioned during a long test of 33 modern violas that I recently document. Certain of them responded to soft but swift bowing, rather than pressure, he explained. Are players looking for the loudest-possible violin? And is "louder than other violins" a big advantage in situations other than a speed-dating comparison study? As with anything, it depends on the situation. Stradivari's instruments historically were louder than their Baroque predecessors, but I have not actually encountered a lot of modern players who have told me that the reason they seek play a Strad is that it's simply louder than a modern violin. In fact, players are more likely to say that the Strad is a little finicky, prone to changing with the weather, difficult to play. What the best Strads do have is beautiful sound, with fully realized overtones. They have a way of teaching and connecting with the player, for the very same reason that they are difficult: they take more coaxing to hone in on that high-quality sound. But when it comes to the finest sound they produce -- the voice of the instrument -- it's amazing. Which might be why the study's conclusion includes verbiage such as, "A belief in the near-miraculous qualities of Old Italian violins has preoccupied the violin world for centuries...."
It's no wonder that violin makers (and a violin maker is at the helm of this study) would like to set all that "near-miraculous" stuff aside. You really can't quantify amazing and miraculous, and yet those pesky concepts seem to always come up when it comes to Strads and del Gesus. Why do players insist such qualities exist in the old instruments? Why indeed? Why don't they pick violins based on blind, 20-second tests? Ultimately, players make subjective judgments about these instruments, based on everything about them: their tonal qualities, projection, visual appeal, feel in the hand, probably even their smell. They also make those judgments based on everything they've learned in a lifetime of playing. I've played hundreds of violins in my life, and I can't ever remember two of them sounding "alike," just like I can't think of two human beings whose voices are identical to me. In playing hundreds of violins, I only ever identified one that felt like "my voice." I bought it 10 years ago, and since then, many fine instruments have passed through my hands -- new and old, many of objectively "better quality" than mine. I have not wanted another. For hundreds of years, many the best players among us have been drawn to the voice of Stradivari and Guarneri violins, and they still are. Not quantifiable, but it's a fact that remains enormously significant. Read Maxim Vengerov's comments in this article on Slipped Disc. Yes, modern makers keep making strides and producing wonderful-sounding violins. This is also significant, and it's good news for violinists who can't afford antique instruments. In fact, it's simply good news for the art of violin. But does a test of five moderns vs. five Strads justify the sweeping conclusions that are floating around in the Internet? In a word: No! May 10, 2017 at 09:39 AM · Turn the issue around and ask: what evidence would supporters of Strads, etc. accept as showing they are not better than modern violins? If the answer is no test or no standard test, then their opinions are based on ideology not fact - are indeed matters of faith. The same issue arose with wine. Tests showed wine buffs were influenced by the label, and others' opinions. Maestro Vengerov thinks Strads are exceptional but how many modern instruments has he put time into? I am not suggesting he is wrong about his own experience but it cannot objectively prove an independent test wrong. It may be that Strads, etc. really are 'better' and I would happily accept that if truely tested. Would others accept that it was not so? May 10, 2017 at 12:17 PM · Here's a more recent evaluation where they DO identify the modern makers in the top five. http://stringsmagazine.com/letter-from-the-scene-at-the-2016-contemporary-violin-makers-exhibition/. There is a pattern of the cream rising to the top in modern makers. There also seems to be a newer, younger generation of makers who are finding their places in the pantheon of great makers. May 10, 2017 at 03:18 PM · I think the first reply to this blog entry nailed it. Anyone who is rich and famous enough to have "ownership" of a priceless Italian antique will say that priceless Italian antiques are better. You know the old quip, "I've been rich and I've been poor. Rich is better." Professional violinists who aren't in that top tier and can't afford truly rare instruments still have reason to claim that Strads are better -- because then what they are really saying, at least partly, is that they can hear the difference even if you can't. Now, in the spirit of fairness, the opposite is surely true too ... it's pretty easy to say "$20000 violins are just as good as $2 million violins" when one can never afford the latter and probably doesn't even have the opportunity to play one even for a short time. The 20-second excerpt should be fine for determining which violin sounds louder. But my opinion on that point doesn't matter because whether the measurement is adequate can be evaluated coldly using statistics. May 10, 2017 at 05:07 PM · After the previous Fritz/ Curtin Strad vs Moderns test I dared mention on Maestronet.com that to fully validate a "scientific test" the same results must be obtained by an independent group using the same criteria. This is standard academic procedure: but I was crucified, with the added value of profanity and racism (I'm not even Italian!!! ), for suggesting such heresy. May 10, 2017 at 05:19 PM · I understand what you're saying, Dimitri. I haven't read the current study, but one possibility is that the principle of reproducibility was designed into the study. For example if each pair of instruments was compared by three different listeners, then the reproducibility might be established statistically. If by more than three, then so much the better. At some point one has to ask how likely it is that an "independent group" would get different results with the same equipment and participants. One must think about where bias seems likely to creep in. A well-designed study is one in which bias is very unlikely to play a significant role. That probably explains why the question of the day was limited to "which of these two violins sounds louder?" The question seems to trivialize all of the other aspects of violin sound, but it's quite possible that this type of question was used because it generates binary data, and the cultural background (for example) of the person writing down the participants' answers just seems very unlikely to matter. A common ploy of skeptics (and I'm not arguing against skepticism) is to say, "Prove it's reproducible," when they know that reproducing the study exactly (e.g., with all the same violins and bows) would be onerous to impossible. The counter argument is to say, yes but it's not just one study that's been done. It's been several. All designed differently but with similar outcomes. That should be worth something too. And who should do the reproducing? Shouldn't the skeptic share some of that burden? May 10, 2017 at 05:31 PM · "One must think about where bias seems likely to creep in. A well-designed study is one in which bias is very unlikely to play a significant role." Right... always with the same hypothesis, and the same vested interests (Mr. Curtin makes new violins). May 10, 2017 at 06:19 PM · I understand that some violinists may feel that a violin may be quieter under the ear while projecting more, but that seems like a pretty extraordinary claim. If they can back it up empirically, that would be pretty cool, but I'd be curious to see the evidence. Just the fact that I can go to a recital and think it's terrible, while another audience member is giving a standing ovation (And that I can disagree with musicians completely on the quality of a performance) indicates that listening is really subjective. My ears can really tell if it was a Strad or a Guarneri del Gesu. It is just like I can tell if a modern instrument was made with new wood or a piece of old wood. I heard an NPR report on the Paris Study the other day, which was by odd coincidence 10 years to the day that The Violin Maker was published. When the report ended, my strongest thought was, "That was a waste of broadcast news time." I tried to write about the Strad v. Modern debate in my book with seriousness, but couldn't help finding the whole argument slightly absurd and somewhat humorous. I still remember sitting through a fairly informal blind comparison listening test in an auditorium at Oberlin during the violin makers' annual gathering there one year. I was sitting with Sam Zygmuntowicz and Joe Curtin and a several other notable makers, and nobody could come to any conclusions. But it seems like the arguments and studies will go on forever. And that's what makes it fun and a perennial source of material for we hacks from the press. May 10, 2017 at 07:03 PM · A really good article, Laurie, and good replies too. As a maker of new instruments especially violas I get the impression that too much emphasis is given on how well an instrument projects i.e. loudness in crude terms. The trick for current luthiers is to strike a balance i.e. making instruments that can project well but are equally able to play a supporting role in a quartet without being too dominant or sounding harsh. Some Strads can indeed do this well (by no means all). Of course when talking about Strads we are talking enormous sums of money and that has a huge bearing on perception etc. May 10, 2017 at 07:17 PM · First off, I was very pleased yesterday with the sound of my $250 Romanian "Genial" violin, practicing in a large empty carpeted dining hall. "Pleased with the sound" compared to what? To how I sounded a few months ago. My point being the player is more important than the instrument. Turning now to this experiment of renowned players of fine instruments selected by superb reputations and cost being no object. One sure sign that such judgements are inherently subjective is the experimenters seemed to try to reduce the criteria to "projection," whereas we all know that "sweet sound" (whatever it is) is not the same thing as volume. No doubt the selection of "favorites" and even of guessing whether new or old actually was a holistic (and subjective) judgement by the players and listeners, even though the experimenters attempted an "objective" (ie, "scientific") approach to the extent they reduced the rating system to projection. My conclusions are that the Strads must have been fabulous instruments if --after hundreds of years!-- they can compete against the best of our newest violins. Conversely, we must have some fabulous luthiers alive today if their work can compete so strongly against violins made by the most superior shops in the judgement of history over the centuries. Those generalizations seem safe based on the statistical analysis of this study. Any more exact conclusions obviously venture into taste and the myriad subjectivities of sound and the value of the history of an object. PS: Congrats to Laurie Niles, the author of this article. My subjective judgement is that she wrote this article with greater nuance and deeper considerations than I found in another article on this experiment, which I read an hour ago in Strad Mag. May 10, 2017 at 08:07 PM · Well written and said, Laurie. I do not think it is fair to say that one type of violin is better than the other....maybe you can make a broad generalization but that would be tough. Different things work for different players. Vengerov works well with his old violin, and those who play modern violins work well with their modern violins. May 10, 2017 at 09:15 PM · Interesting article. It seems there are many things at play. The media specifically likes to poke at the established narrative, so because "science" proves that Strads are not objectively as nice as many musicians say. This is not news to many violinists. A relationship to an instrument is something that develops over time. These tests are not really about which violin is "better" (as if it depended on the violin alone), but on how well the players know the instrument in their hands. If anything these news articles are trying to say that players really cannot tell the quality of an instrument by sound, which is news to the non-playing world. Truth is, we can, if it is an instrument that we are familiar with. Although it is impossible to make such a test, if we could mix-up labels and let players play a week on each instrument, I wonder if the results would stand? May 10, 2017 at 09:26 PM · The old italian violins are four things all at once: 1. beautiful 2. old 3. supremely functional 4. typically have a a fascinating provenence. There aren't too many objects around like that, hence the mystique and the value. We can also give them credit for perfecting the violin. But it is not reasonable to believe that something made 300 plus years ago is going to be "better" than something made a few years ago by the best luthiers in their world. There aren't any secrets in the making of violins that have not been discovered (or rediscovered.) That is what the well-designed blind tests show. May 11, 2017 at 01:05 AM · Once a study has been published and has withstood the test of peer review prior to publication, then the burden rests with the skeptic (reader) to discover and expose its flaws or improve thereupon. He or she may do this by describing aspects of the design that are not in keeping with modern standards, or by conducting his or her own superior tests. Pointing to an apparent conflict of interest on the part of the authors, even though glaring, is not by itself a scientifically compelling objection, especially when the authors disclosed that conflict in the header of the article. "Conflict of interest statement: The authors note J.C. is owner of Joseph Curtin Studios, which builds violins and violas. F.-C.T. is an employee of D'Addario & Company, which manufactures orchestral strings." May 11, 2017 at 05:46 AM · It may be just a matter of time, Paul. There is certainly enough vested interest in the rare violin business to finance a counter-study! But in a way, that's how science, or perhaps more precisely, academics works... when Dr. Linus Pauling discovered that taking loads of Vitamin C was good for you, scores of researchers took the cue to seek fame by proving him wrong, and eventually did. May 11, 2017 at 06:28 AM · Since there has been so much debate about the issue of new versus old, it means there isn't really major distinction and the human ear is not really able to clearly favor one over the other. It has become a matter of taste and perception. Sometimes too much analysis leads to judgement paralysis. Music, at the end of the day, is a personal taste and no two people would agree on what's right or wrong. So I think, new violins are as good as old ones. Once a musician finds the violin that he/she can relate to its sound, then this violin would be the "favorite". May 11, 2017 at 01:12 PM · Dimitri, I don't anticipate the foregoing will have any effect on the investment value of rare Italian violins. If anything, it churns the press and generates additional interest. That's good news for you because the more dear the violin, the more need to cradle it in an exquisite and securely protective case. May 11, 2017 at 01:16 PM · Christian Lesniak wrote, "I understand that some violinists may feel that a violin may be quieter under the ear while projecting more, but that seems like a pretty extraordinary claim." A moment's thought will reveal that extraordinary claims are a basic requirement of any faith system. Mohammed Hajjar wrote, "Since there has been so much debate about the issue of new versus old, it means there isn't really major distinction." I'm sorry, but that is a false conclusion. Just because there is just as much talk on both sides of an issue doesn't equalize their veracity. This is the same principle that "skeptics" of established science (climate change, evolution, the cause of AIDS, vaccine safety) use to demand equal consideration from our press, our public schools, and our policy-makers. Remember what "fair and balanced" means -- it means equal time for bad ideas. May 11, 2017 at 01:48 PM · The Strad is the most harmonically balanced violin on the face of the Earth! It has the same forgiveness to the musician as Christ has to the sinner. Its tone will penetrate through walls. Its caressing quality is most soothing to the acoustic nerve. The news media is about as trustworthy as Hitler. May 11, 2017 at 02:31 PM · "Fair and balanced"... well said, Paul. And lest we forget, the fact that bumblebees are incapable of flight owing to insufficient wing area has a basis in science as well (although, since they are unaware of this, bumblebees fly anyway). May 11, 2017 at 07:31 PM · It's a hugely more complex issue that these experiments have accounted for. What IS ideal violin tone? And we might ask, "Historically, what player-axe pairings have produced the best tonal qualities on recordings?" Some of these have forged the paradigms in our brains by which we now judge contemporary performance, e.g. Heifetz/del Gesu, Oistrach/Strad, and so forth. Pretty hard for a copy to beat the originals, for this reason alone -- the antiques have set the tone, so to speak. In any case, a good fiddle is hard to find . . . Thanks for this article. No matter what side of the debate on old instruments one stands, I want to comment that your article is an excellent example of critical thinking. You pointed out that they actually draw conclusions that cannot be drawn. In the spirit of the science of Statistics, their sample size is way too small. (As you pointed out, perhaps without realising it!). I hate it when the media (or even researchers themselves) make sweeping statements. But this is a good dissection of the facts vs the interpretations. And misunderstandings. May 11, 2017 at 08:27 PM · Mr. Hajjar, you said it perfectly with your response. May 11, 2017 at 10:55 PM · Every violin is different and should be judged on its own merit regardless of who made it and how much it costs. I've played really dark Strad's and really bright Del Gesu's and I've played instruments from both makers that were real crap. Instead of comparing old to modern, I think we might be better off determining whether a violin is, regardless of whether it is modern or a fine old cremonese, objectively good. Tone quality may be subjective, but things like response time, dynamic capability, and projection are not. Although that's not to say all those things are be all and end all. They can be tweaked with the right bow, strings, fittings, set up, etc. One thing I refuse to do is wax poetic about a multimillion dollar fiddle that objectively plays like garbage. May 12, 2017 at 03:28 AM · The study is interesting but has issues. One: first impressions of a fiddle are not the final answer. Arnold Steinhardt discusses this humorously in his book "Violin Dreams." He likens it dating: one-night stands, brief flings, and long-term relationships. It would be interesting to have each study participant use their favorite modern instrument from the contest for a year or more, learn to work with it, then come back for a follow-up. Doubtless some would change their minds. Two: Audience voting is interesting but essentially irrelevant. The audience isn't playing the concert. The audience doesn't choose the performers' instruments. The players do. Three: history. Out of thousands of makers active from 1600 on, Stradivari and Guarneri del Gesù have been elevated to the top of the pyramid by player experience. Yes, dealers have poured out oceans of purple prose and glossy catalogs to make sales. Doubtless they have influenced the conversation tremendously. But any other makers, had they been good enough, could have been elevated to the top instead. If we could return in a hundred years and find out that violins made by Francine Smith are trading for large sums, and are favored by soloists everywhere, then good ole Francine by definition is a great violin maker. There are some wonderful makers active right now, and I do think we are in a modern golden age of lutherie. Which makers will rise to the top over time and long usage by players is very hard to say. May 12, 2017 at 05:07 PM · About 20 years ago I purchased a violin from a modern maker. Since my career was in engineering with violin playing more as an expressive escape, I was able to take my time in order to find exactly what I wanted. I tried many violins. There was not a great deal of difference in the sound of the instruments I tried versus the violin that I had played since my youth. I was somewhat discouraged expecting more variation from violin to violin but then I came across my current violin. It was one of those “Whoa” experiences. This violin sounded for some reason like it knew how to be a violin. It resonated from G to E string 9th position C. As an engineer who as part of my training and career dealt with acoustic related issues and designs, this fascinated me. What did this violin maker do right? Why was there such a difference in the sound of this instrument? The modern maker of my instrument was an Italian by the name of Dino Lelli. He had the unfortunate fate to begin his own shop in Italy in 1939. My guess is that his life was not easy. The violin I purchased was made in 1989. Dino Lelli really did a great job on this violin. I have since studied violin acoustics. There has been a great deal of impressive work beginning with Carleen Hutchins and her collaboration with MIT. She and her colleagues were able to determine methods to verify proper forming of the top and bottom plates using modal resonant frequency methods. The formation of the Cat Gut Society was another of Carleen Hutchins contributions. There has been some impressive work and scientific papers published by Nigel Harris of the UK. Many have studied and contributed. The bottom line is the “Golden Age of Violin Making” did not happen accidentally. There is a reason behind this renaissance and it required a great deal of work. Now if a modern violin maker is so inclined there is an abundance of useful information on how to make a violin be a violin. Yes I know about a lot of these comparison tests and have made a number, myself. I don't paint myself into a corner as some people do, saying that the old classic instruments are necessarily the best or that on the contrary, it's all a myth. A lot depends on the particular instrument and the particular player - and this is true of bows as well, which are such an important part of the equation. There is an unpredictable 3-way chemistry of player, violin and bow. I love fine old violins and I'm also a big fan of fine contemporary work - and in the past several decades there has been a real Renaissance of excellent making all over the world. I currently own several contemporary violins, custom-made for me as well as some fine older bows. Many classic old instruments are not so hot but a few are indeed, magical. I have personally tried about 8-10 Stradivaris, 3 Guarneri del Gesus, some Amatis, Guadagninis, Vuilliaumes, Poggis, Fagnolas and other modern Italians - and a great many contemporary violins. Based on these expreriences, research, etc. it is my considered opinion is that the best contemporary instruments compare very well with all but the top 10% of the classics. My overall favorite contemporary violin has compared very well with a few Strads and other big names. If you have a chance, please go to my website - http://rkviolin.com and read my blogs, "An Auction Adventure", "My Pilgrimage To Cremona" and "A Tale of Two Fiddles" for some of my personal experiences with fine violins, new and old. May 13, 2017 at 04:28 AM · I'm surprised that no one has pointed out that the Strads are NOT old instruments. They are not in the condition the master made them at all. All have new necks, morticed in rather than nailed and glued on, have new bass bars, meaning they had to be taken apart, all have new bridges, etc. They have all needed repairs, have all needed degrees of reconstruction, have all been in pieces at one time or another. Totenberg's Strad spent a year in restoration, a good deal of work must have gone into that. How many ugly Strads have you seen? Whatever mysteries might have been in the original varnish has been overlayed. They were always good instruments so they were always given the best of care, but they are the sum of the masters who were in charge or their curation over the centuries, instruments that were not designed to play past seventh position, but have been fundamentally altered to allow them to do so. Whatever sound Stradivari had in mind is not what we hear today, but by good luck, his model translated well into the modern ideal. Other early makers such as Stainer were highly praised but did not convert as well. We've heard many reports that Strads don't like to be forced, which is unsurprising since they wouldn't have been originally. Still, there are I'm sure some recognizable characteristics of the instruments, but they are hybrids, part original and part Vuillaume or Hill or whatever. I wonder how many Strads played in today's concert halls have not had significant work in the past 75 years. May 13, 2017 at 09:51 PM · Volume of sound is not a major characteristic that violinists are looking for. Sure, the violin has to be loud enough to be heard, but clarity, purity and the ability to colour the sound the way violinist needs are more important. I used to play a modern Italian by Cappicchioni which was incredibly powerful compared to my old Italian, but the sound is, again in comparison, somewhat one dimensional, lacking in complexity and variety of colours. I now don't play my modern instruments. Simply, in this instance, old is better. In order to really understand an instrument, and get the most from it, months rather than minutes are needed to be able to make a judgement. Superficial preference to loudness shows how the ears are easily seduced. May I point out that every modern violin is a copy of an old. To say they are better is like arguing that a modern print of an old master painting is better because the colours are brighter. How can a copy be better than the original? By definition a copy is merely an attempt to recreate the original. May 14, 2017 at 02:19 AM · Like others, I have followed the old vs new violin tests that only allow the players a small time of playing of each instrument. What I’ve heard and read is that one needs time to become acquainted with the great old instruments; then learn to pull the best sound from them; a process that takes weeks and more. And I am sure that the new instruments also take time to know and drive properly therefore, I am skeptical of the value of the quick comparisons. But an opportunity to try a great violin for only seven minutes, I would not pass up. May 14, 2017 at 03:29 AM · 107.139.243.173 made some interesting points. However, we can nit-pick about how much needs to be intact and original to be considered a Strad - and if enough is, then it IS a Strad and therefore old. Also by now a lot of the alterations are old. In terms of modern necks, most of those go back to the mid-19th century - not exactly new, though of course, not original. As far as worn and overly retouched varnish, there are a handful of samples with varnish close to original condition. Most obviously but controversially, the "Messiah" Strad which many have expressed doubt over its authenticity. But then there is "La Pucelle", the "Lady Blunt" and the "Betts" - all in superb condition. As far as a Strad not liking to be forced, the conventional wisdom is that a del Gesu is just fine - in fact responds best - with really digging into it. So what does that say about how the violin was played at that time? True, many were re-graduated, but Paganini's del Gesu (Ill Cannone) was left intact with really thick plate graduations and from what I've read, needs a bold approach. However my last playing experience with classic fiddles, I had the opportunity to try a Strad and del Gesu back-to-back. I was like a kid in a candy store! With those particular instruments I found the opposite of the conventional wisdom to be true: the Strad lent itself to digging-in while the del Gesu responded better with a more horizontal sweep. We should keep in mind that there is no ONE Strad sound and that things said about say Strads vs del Gesus are generalizations. To Carlo's point about copies, on the surface the analogies work - yet I must differ: not all modern instruments are copies; some are personal models. Also, sometimes a copy CAN outdo an original. Violins are complex with many variables and even a close copy can be different enough just with different wood, wood treatment and varnish to be more successful than the original - or less so. 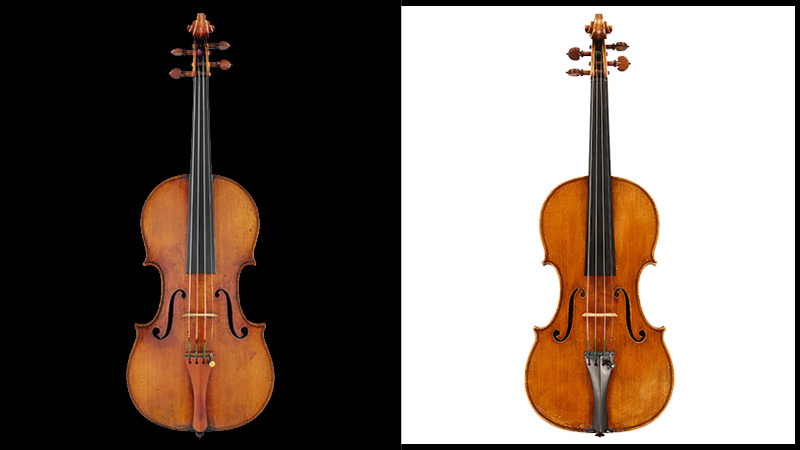 And even slight differences between the original and the copy that few would notice - in dimensions, arching and plate thickness can make a significant can make significant changes for good or ill.
Also, let's remember that Strad necessarily made NEW violins which were well appreciated in their time. Unless we win a mega lottery - and maybe even then - let's give new ones of today a fair chance! May 15, 2017 at 01:35 PM · I do not necessarily think that modern violins are less likely to have colours. It all depends on the player. A Strad or D Jesu can be played without colour. Gradations of sound, volume, colour, are really in the hands of the player, and not the instrument. Of course, an instrument must be good enough that one can get all these things - but age is not necessarily the requirement for great sound, colour, and projection. Great players sound just as wonderful on modern or old instruments. May 15, 2017 at 10:23 PM · Kreisler said 75% of the sound is the player. I have heard really fine modern violins in the hands of at least half a dozen of our truly great violinists. No names but I'm sure you could guess! Yes, the moderns sound wonderful and I'd be happy to play them but the subtle differences and nuances and the apparent lack of effort to do this with a great old master is easily apparent to anyone with ears, 1/2 a brain and knowledge of playing. For instance, I heard Perlman playing the Beethoven Concerto on the "Soil" recently. I have never yet heard a modern violin, say mid to late 20th century that was able to deliver that kind of quality across the board. I'm sure I couldn't do it but in the right hands...no question. Why would Heifetz, Zukerman, Perlman and all the greats play on them . Simply because they are better at what they do. And none of these great players are snobs! May 16, 2017 at 11:18 AM · Perlman's "Soil" Strad is indeed one of the great classics that I had in mind when I said earlier that the top 10% or so of classic violins really are special - even magical. That also goes for Zukerman's del Gesu (I think it's called the "ex Dushkin") In many cases, though, there is the status factor. So and so's bio might include "Mr. X plays on the such and such Stradivarius" - which may or may not be one of the great ones. Olivera regularly plays one or another of his contemporary violins in public performances, alternating with his early "Stretton" del Gesu. I think that when it came to Kreisler it was closer to 90% or more of the sound being about the player. Once during Kreisler's still active career period a wealthy amateur came into Wurlitzer's - the biggest dealers in the Western Hemisphere at the time - and asked them to find him a del Gesu to help him match Kreisler's sound. After a long search they contacted the man and said "We found something that we think you'll like". The man came to try it and was elated at first and took it home for a short trial. Meanwhile Kreisler gave a concert during that trial period which the man attended. Right after that the man returned the del Gesu saying "No, this violin doesn't have Kreisler's sound after all." Shortly after that Kreisler himself stopped by at Wurlitzers for a minor adjustment. They said to him a little ruefully "Mr. Kreisler, your wonderful playing cost us a big sale!" Said K. "It gets better. I was playing on my Vuilliaume that night!" In any case, even if a violin - new, old or whatever - accounts for only about 5% of the sound that we associate with a player, that 5% counts for a lot. Regarding the question of under-the-ear loudness vs projection at some distance, I have found this to be true many times. All combinations are possible with any given violin: strong near and far; weak near and far; strong near, weak far; weak near, strong far. Paolo Peterlongo in his book, "The Violin" said that it had to do with the relation between a particular violin's fundamentals and its harmonics. My sense is that complexity projects more than surface loudness. Also there's more than one way to project. Some violins - and players - project with a kind of surround sound; others project with a more direct laser-like sound. And different players will match differently with different violins. Once Ysaye and Jacques Thibaud made an experiment with Y. 's Strad and del Gesu With Y. playing and T. listening at a distance, the del Gesu projected better; with T. playing and Y listening at a distance the Strad projected better.